Four decades after the end of the Cultural Revolution, a former Red Guard felt obliged to write in detail about what she experienced in that decade in her blog. But she is among the minority and destined to feel lonely as most of the millions of former Red Guards choose to remain silent. In her 60s, Yu Xiangzhen looks kind and peaceful. It is hard to imagine her persecuting anyone. She was once one of the "Red Guards," the young people whose frustrations were chaotically set free during the Cultural Revolution (1966-76) under the banner of Mao Zedong's assertion that "It's right to rebel." 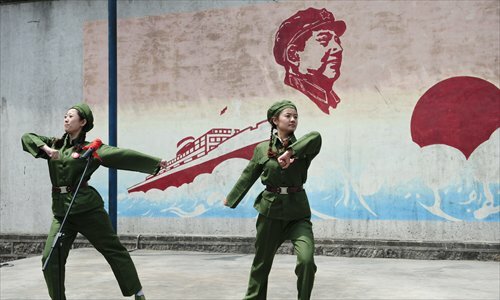 One of the millions of Red Guards, Yu still remembers clearly how she felt confused as a 13-year-old girl caught up in a political movement that was frightening in its intensity and violence. Now 40 years have passed since the end of the Cultural Revolution, Yu has started sharing what she has experienced in those 10 years. Starting from January 11, she has written 25 blog posts about the Cultural Revolution, with mixed feelings of guilt, fear, and understanding. Then the Cultural Revolution began, Yu was a freshman at a junior middle school in Beijing. Becoming a Red Guard was an obvious choice because her parents, who later became State media journalists, were both soldiers before 1949. As a Red Guard, Yu witnessed almost every phase of the movement, from criticizing and abusing teachers and other authority figures to confiscating the property of so-called "class enemies" and destroying cultural relics. "There have been articles reflecting on the Cultural Revolution. But most just stress the negative side and ideology, and are not persuasive. My stories are about specific things. I hope to draw the readers back to the historical scenes I revisit in my article and feel it themselves," Yu told the Global Times. After the political movement was over, the Chinese government and the Communist Party of China (CPC) admitted that the Cultural Revolution was wrongly initiated by Mao Zedong and said it was used by anti-revolution cliques for political purposes, which wreaked havoc on the nation. Yu's blog started with the troubles in schools and went on recalling scenes she witnessed during that 10 years, ending with the story of a widow who was driven mad during the movement. Some netizens called Yu a "big hero" or "true man" to show their respect. Among the millions of former Red Guards, Yu is one of the few who have stood up to tell their story. Previously a senior editor for a children's newspaper, Yu started to write blogs 10 years ago, mostly about travel. But on January 11, after listening to a lecture by famous writer and former Taiwan "minister of culture" Long Ying-tai, Yu was inspired. "The lecture said that everyone is obliged to record what we have experienced, to replenish the nation's history. Getting older and older, I know I could die any day. If I die, no one would know what I have experienced," Yu said. But not everyone is happy to see her frankness. Besides praise, there are also questions about her motivations and accuracy, and even insults. "I don't fear being questioned. I fear indifference. Fifty years have passed, if we don't talk about it today, our whole generation will vanish," said Yu, adding that some of those who criticize her are Mao-worshippers who hope the Cultural Revolution would come again. During the interview, Yu said several times that she "was asking to be cursed." It took courage for her to admit her role in the movement, especially as Red Guards are now widely reviled. Admitting they were "hateful," Yu explained how her whole class criticized one female teacher surnamed Zhang just because her name included a character which they associated with Christianity, as all religions were banned at that time. As Yu wrote, she "followed the current" of criticizing the teacher. She also tried to change her name to become more "red." Now looking back, Yu admits her and her classmates' guilt, but says the society they lived in should not be ignored. "Before and after the Cultural Revolution broke out, what we learned by heart is 'when treating enemies we should be as cold-blooded and severe as winter. '," Yu told the Global Times, "So we were so single-minded, without a second thought, we would join in persecuting others. We would not have been like that otherwise." "I irrationally blamed my negative feelings after going to middle school on innocent teacher Zhang," she wrote in her blog. "Persecuting teachers is the most shameful thing in the world ... and we committed such a unforgivable crime," she wrote. Now looking back, Yu admits that it was her and her classmates' fault even though they were teenagers at that time. "It was us who did those things. We cannot erase it," she said. While some see this year's 50th anniversary of the start of the Cultural Revolution as a good time to reflect, up to now, few Red Guards have stepped forward. "There won't be a burst of activities," predicted Yu. She noticed that most of her classmates, who were also Red Guards, are against her writing. Some classmates asked Yu why she still harps on about it even though their teacher had forgiven them since they apologized in 1990, and said they "were just children." "They said my articles will lead people to think the violence in the Cultural Revolution was our fault," said Yu, "Some even said I spread rumors and some said I wanted to get famous through this." Her support for apology and reflection also once led her to be at odds with two of her classmates when former Red Guards Chen Xiaolu, son of former vice chairman of the Central Military Commission Chen Yi, and Song Binbin, daughter of revolutionary general Song Renqiong, publicly apologized for their actions several years ago. Yu said her classmates don't want to "ask for troubles." "People whose parents were victims at that time are particular careful, daring not to talk about it today," said Yu. At present, other memorial articles about the movement can be found in Yu Jianrong's writing project "The Older Generation's Story" in which he encourages people over 70 to tell their life stories. Most of the Red Guards were later sent to the countryside to live and work with farmers during the Cultural Revolution. When they were at last allowed to return to the cities in late 1970s, a wave of literature reflecting on how they were victimized by this political movement emerged, which was later called the "Scar Literature." About a decade ago, books like Repentance of Red Guards and 10 Years of 100 Chinese were published, some of the first works to reflect on the role of the Red Guards as perpetrators of violence. "It is common for people to choose to keep silent, both those who are for and against the movement, to avoid trouble," noted Ren Chonghao, chief press officer for news portal guancha.cn and famous online blogger who goes by the name Maqianzu. To him, reflecting on the Cultural Revolution can make people suspicious that one is "denying the achievements of the CPC." After Yu's blogs came out, one netizen commented that she "is neither criticizing Mao Zedong nor the Cultural Revolution, but criticizing the CPC." But Yu denies this, saying "Why should I? Nearly all my family are Party members. No one could wish that the Party well as much as me." Ma Yong, a researcher with the Chinese Academy of Social Sciences, agrees that reluctance to discuss this matter naturally makes people cautious. But he meanwhile realized there is a reason for such an environment. 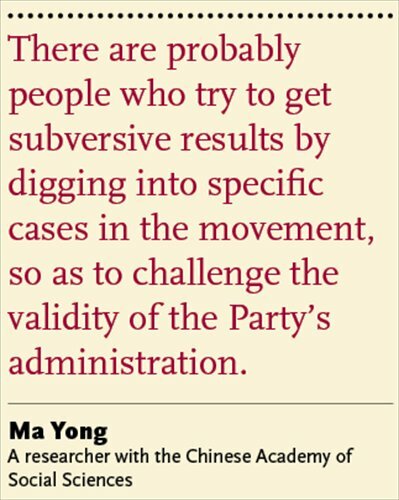 "There are probably people who try to get subversive results by digging into specific cases in the movement, so as to challenge the validity of the Party's administration." Yu feels lonely. With pity, she notices that her classmates are mostly busy taking care of their grandchildren, indifferent to that period. "To say nothing of those who haven't experienced it. People would feel uncomfortable if you bring up this topic on the street," said Yu. Yu explained that she wrote her blog for young people and generations to come. "Some who haven't experienced it, after learning about it fragmentally, even feel that period is good, considering that students didn't need to go to classes, could travel by train for free and beat corrupt officials. The illusion is too appealing to young people," Yu stressed the necessity to let people alerted for the disastrous movement. She feels a particular threat from left-wing researchers who more or less feel the Cultural Revolution was necessary at that time and disagree with official references to it as a "mistake." Ren said although the Cultural Revolution was not a successful movement, what it tried to destroy was not ideal either. "It is a test that the whole nation tried but failed to pass. If passed, the creativity of the 1.3 billion people could equalize half of the world," he said. Ma calls for more room in researching the movement. "History is always specific. Every case has specific reasons behind," he said. He holds that the job should be taken by historians to get rid of the influence of ideology. "It is not fair to let a government to shoulder its predecessor's mistakes. A close look could provide lessons for the ruling party in the future," said Ma, adding that reticence on this matter only makes things worse. But not everyone thinks reflection is necessary. "The Cultural Revolution has been denied for over 30 years. We have so many problems to solve. How can today's problems be solved by making society fight over history?" said a scholar that writes under the penname Cheng Wei who was a victim of the Cultural Revolution. "We cannot forget history, but history should not be a burden," he said.